excercises in the park), medical walks, a bar service and restaurant. Montecatini is a tourist city that offers many recreation possibilities. For those who love sport or who love to attend sport-activities, it is the ideal place while its facilities are of a great variety: from the race-course where international competitions are being held, to bow-shooting, golf and mainly basketball. 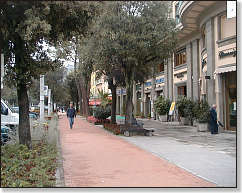 For those who adore shopping however, Montecatini has a wide variety of shops. From the artisan corner-shop till the prestigeous boutique. Montecatini can guarantee you evening recreation, one can you to restaurants where the mot delicious typical tuscan dishes are being served, one can listen to life music and go to discothèque. In Montecatini you can also take the funicular railway that connects Montecatini terme with Montecatini Alto., an ancient village that dates from the year 1000. The funicular railway has been created in 1850, is still functioning perfect, and has a characteristic style thanks to the use of the original cars and wooden interior. Montecatini Alto offers the possibility to its viitors for a walk in an ancient village and at the same time offering all the conveniences of a modern city.Montecatini si trova nelle estreme propaggini appenniniche ad ovest di Serravalle Pistoiese ed occupa la parte centrale della Valdinievole.